Since May 2012, I’ve been using an iPad and a set of Bluetooth pedals in virtually all the concerts I perform. Reasonably often I’m approached with questions about the pros and cons of doing so, as many of the same questions come up again and again, I thought I’d put my thoughts on the subject online. 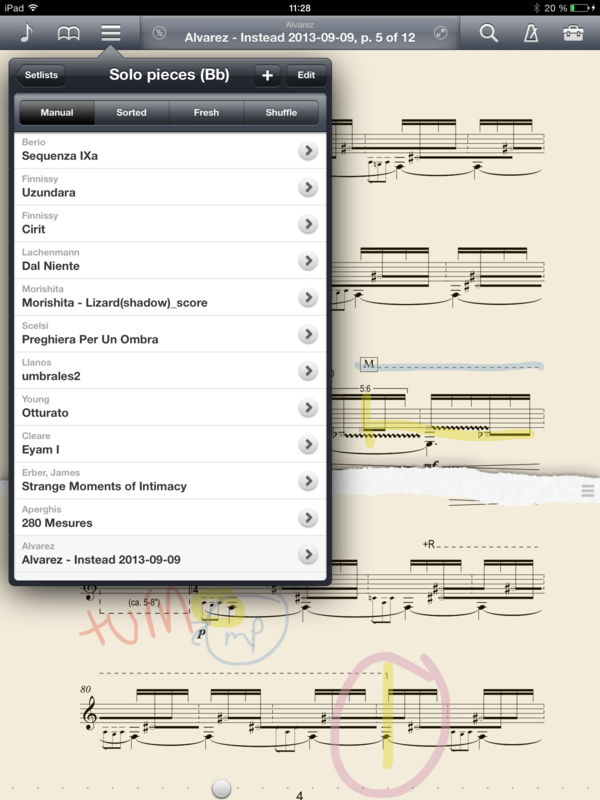 First of all, how it works: I use an app called ForScore on the iPad itself. 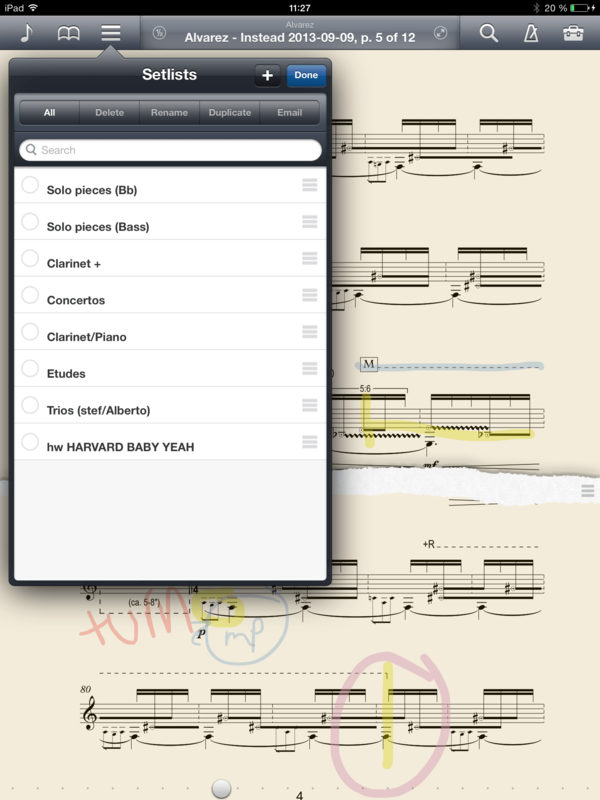 The app allows me to flip quickly between pages, annotate scores, display them in different ways (vertical scores and ForScore’s ‘half page’ turn function is a favourite) and categorize them as I will. 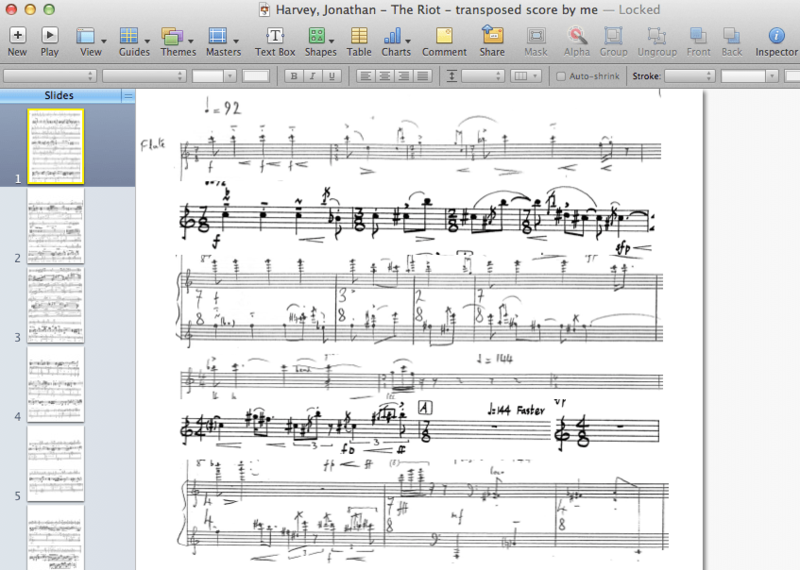 I either e-mail scores to myself or use ForScore’s connection to my Dropbox. The Bluetooth pedals are from Air Turn. As they use Bluetooth to communicate with the iPad, you can use them with any device or app that communicates via Bluetooth (I’ve been known to use them when I’m reading a document on the iPad and knitting at the same time, thus dispensing with the need to ever put my knitting down!). By the way, I bought the Air Turn pedals that separate (I was worried about accidentally hitting the ‘back’ pedal in concert), but the connection is a little flimsy with these, I would recommend going with the fixed ones. update: Hours before a concert in Vienna in October 2013, my Air Turn pedals fell apart. The only thing holding the wiring in place on the pedal is a long sticker that runs the length of the thing – it seems now that inevitably I would grab the pedal in the wrong way and rip out the wiring. That said, it meant (after I somehow survived 3 concerts on tour without a pedal), I bought a Boss FS-5U – a guitar pedal that works with the transmitter supplied by Air Turn! This thing is seriously sturdy and it’s also a more distinctive shape, MUCH easier to find with my foot on stage. I can happily jump on it, rock star style. This is living the dream, people. If you want to start by using the Boss pedal, then what you need to buy from Air Turn is just the transmitter. One thing I definitely regret is not getting an iPad with more memory. I assumed that the basic 16GB iPad would be enough for all the scores I could possibly need. WRONG. It’s filled up very, very fast. There is also a stand attachment that attaches to a microphone stand, which fits the iPad perfectly (called the Gig Easy). I’ve never used mine, however. First of all, I’d have to carry a microphone stand around with me. Secondly, if I’m playing with an ensemble, it would look very strange if we weren’t all using similar looking music stands. I know Carl used it once, I think because he could have the stand very close to his face, in order to facilitate the obstruction that is a contrabass clarinet and reading a score that couldn’t have been cut into pieces (Evan Johnson‘s Ground, if you’re interested). Update: I have started using the Gig Easy a lot more often. Truth be told, there are usually mic stands everywhere you go. And the stand is great in that the audience can really see your face while you’re playing. There’s no interference from the music stand, somehow it feels just that much more intimate. It has taken some getting used to – the first few concerts I played felt a little more stressful than I would have liked. ForScore went through a phase where it crashed occasionally, which has happened twice in concert, though in hindsight it was no more disastrous or time consuming than some of my sheet music falling off the stand. It’s been about 9 months since that last happened, however. One thing I did notice about the pedals: always keep them charged! One concert I performed with almost totally drained pedals, and instead of changing pages of the score, it would flip to different scores at random. Not the kind of excitement one wants on stage, really. As you can see, it doesn’t quite line up perfectly, but it was the fastest way to make something functional and I got used to it fairly quickly, and managed to use it in performance. One thing I’m really enjoying is using setlists to keep music organised and make things easier to find. At first, I only used this feature for concerts (all the pieces in concert order in one setlist makes it very easy to simply “pedal-through” the entire concert, constantly having to tap at the screen during a performance looks very strange indeed). 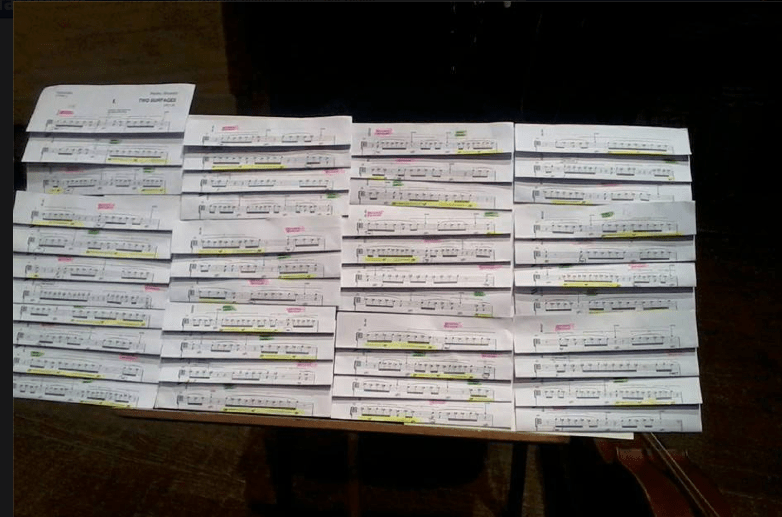 Speaking of Pedro Alvarez, here’s a shot from a later performance by another ensemble of his Two Surfaces, and the paper solution for a score that is apparently much better suited to iPad reading. Need I say more? * In chamber music one can always play from the score. It doesn’t matter if there are 50 pages. (It does matter if clarinet parts aren’t transposed in the score though. Grrr.) It has made a huge difference to life with my ensemble, hand werk, that at least two of us always have the score in front of us. Saves a lot of time in rehearsal. * I never forget my music (well, unless I forget the iPad, but that’s less likely). Not only that, but I have everything with me, all the time. Not even just the music I need, but quite a bit of the IMSLP database as well. Ahem. * In collaboration with composers it’s very handy to be able to answer questions about use of effects or notation thereof by referring to existing solo/ensemble repertoire. Convenient also, that I have everything right there with me. * The annotation options with ForScore mean that things can be big, be in any colour you like, and can either stay there forever or be erased without leaving any trace. * I’m sure I’ve saved a few trees since I started – no more printing out pages and pages of scores. Also very handy when not all the music for a project has arrived by the time you’re on the train/plane. * No more needing eight stands on stage for a solo piece with no page turn opportunities! No more doing that silly dance down the stage, while the audience knows exactly how long it’s going to take you to finish the piece (well, I think it looks silly anyway). No more worrying about this problem when studying pieces with electronics, where you can’t move across the stage as the microphones keep you in a fixed location! 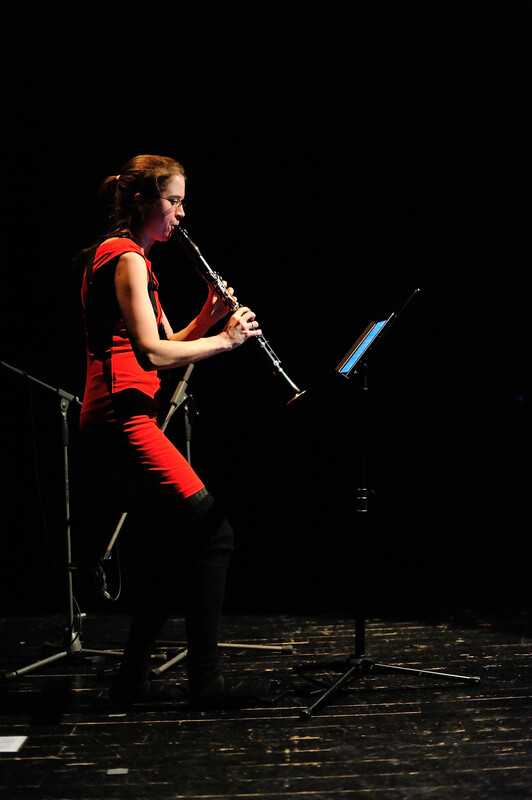 * Getting on stage with a clarinet, bass clarinet, the iPad and my foot pedals has resulted on a few less-than-graceful entrances on stage. Worse still is leaving the foot pedals on stage while keeping the iPad in hand – if you’re too far away the bluetooth connection will need to be reestablished once you’re on stage and that can take some time. * If you’ve cut up the score a lot to make it easily readable and have 50 pages for a 10 minute solo piece, it can be difficult to practise while having a solid overview of the piece in mind. * ForScore crashing during a concert was possibly one of the most frightening moments on stage. Although as I wrote above, it hasn’t happened for months now, so they’ve quite possibly sorted that problem. * A full day of rehearsal with hand werk can drain the battery of my iPad almost completely and an iPad takes all night to charge. It’s not a problem as long as one is prepared, but it’s another thing to get in the habit of thinking about. * Discussing aspects of working off the iPad with your colleague who uses one will annoy the colleagues who don’t use it to no end. Oops. Sorry, guys. Unfortunately I don’t really have an answer here, since I’ve only tried this with the iPad. It’s true that something with a slightly larger (A4 sized) screen would be just a tiny bit more practical, and my colleague (the cellist in hand werk also performs with iPad) is always talking about trying something else, but hasn’t managed to do it yet. An expensive experiment. I’ve also heard that the resolution is best on the new iPad, that no other tablet (or the old iPad) can possibly compare and this would be very important for readability. update: Our flute player has recently invested in a Windows tablet, which he seems very happy with. The communication between the tablet and pedal seems to be similar to the iPad. The only thing I’ve noticed is that the resolution is not nearly as good as with the iPad 2. Aren’t the notes often too small? There are a few answers to this. Yes, often the notes are much smaller than one would expect or want with paper, but often, the smallness is made up for by the extreme clarity provided by the screen and its backlighting. 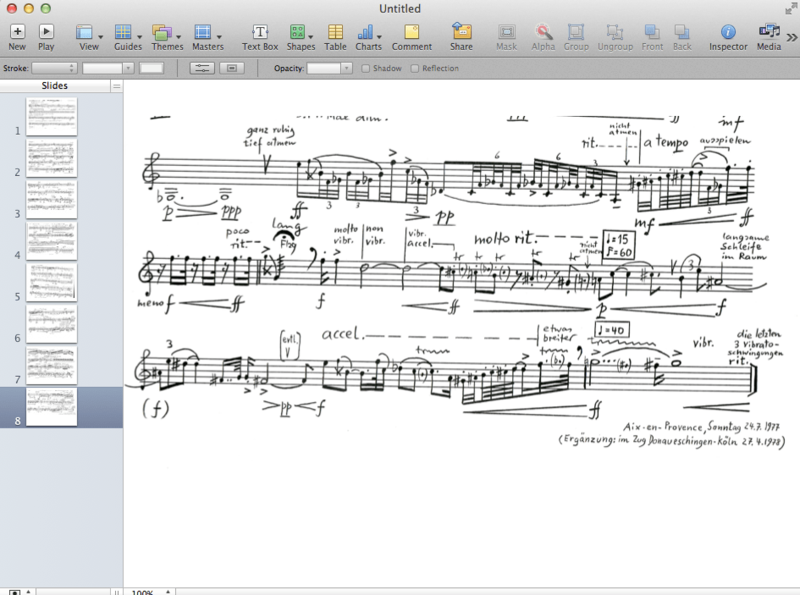 Secondly, I often edit scores so that they can be more easily read. It doesn’t matter how many pages you have, as page turns are no longer problematic, and even though it takes some time to find the best process for you, in the end it’s faster for me than having to cut up a part for performance. Right, there you have it, for now. Any other questions? This entry was posted in advice, on technology in music, performance and tagged apple, bluetooth, gadgets, ipad, new music, on technology in music, ontemporary music, performance. Bookmark the permalink. 5 Responses to why iPad? 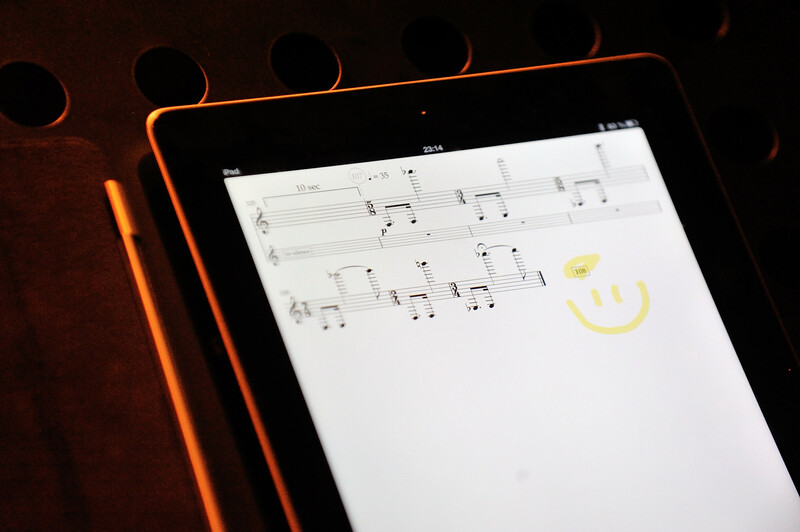 Thanks for this detailed account of using an IPad in performance. I especially noted that you prefer a transposed score for better rehearsing. As a composer, I provide transposed parts, of course, but usually choose to make a C score for ease of score study and checking vertical harmonies. Good to know reasons for the opposite choice.